For those men looking for the ideal professionally straight edges on their beards, the Philips Norelco Beard Trimmer 9100 offers a dedicated beard trimmer with a built-in laser guide to keep your trimming straight and on track. The laser system allows you to create the exact look you want. Laser guide for precise control. Dual sided trimmer for trimming and detailer. Shelf Sharpening Chromium steel blades. The 9100 comes with 17 hair length settings running from 1/24” X 9/32” (0.4mm to 7mm.) These settings will also allow you to have that perfect stubble look. It comes with two combs, one for trimming the beard and one for detailing. This dual-sided trimmer has a wider end for perfectly straight lines on your neck as well as sideburns and a narrow end to style hard-to-reach areas around the nose and mouth. The Norelco trimmer 9100 has a pop-up laser guide that projects a line directly on your face so you can properly align the trimmer before it touches any hair. This helps you create perfectly straight and symmetrical lines every time. And because the laser is Class 1, the light it emits is completely safe for the eyes. The 9100 uses Chromium steel blades. These blades are self sharpening so you don’t have to spend your time oiling the blades. The blades´ rounded tips and combs will help to prevent any skin irritation and will glide smoothly on the face. Norelco has made it easy for you to clean the device by simply rinsing the head (minus the comb) under running water. This device comes with a Lithium Ion battery and can be used with or without the cord. Its rechargeable battery provides up to one hour of cordless use after one hour of charging. The 9100 is not water proof and it comes with a digital display so that you know what trimming length the trimmer is set to. It also comes with a storage pouch to keep the device and the combs in. There are several features that customers like about the 9100. Trimmer can be used while plugged in: There is nothing more frustrating than having your trimmer run out of power in the middle of using it. Users really like the fact that this trimmer can operate with and without the cord. Only 2 Combs: Users like the fact that it comes with only two combs. Most users hate trying to keep track of trimmers with too many accessories. Number of Length Adjustments: Consumers also like the fact that this product comes with such a large variety of length adjustments, making it possible to choose the length they really want. Charges Quickly: The fact that it charges extremely quickly is another pro. Charging Light: It may seem like a small thing but people find that the charging light on this device is extremely useful. Well Made: This is a solid and well made trimmer sure to last for a long time. It measures 1.8” X 1.5” X 7.2” and weighs about 1 pound. Shipping weight is 1.1 ounces. 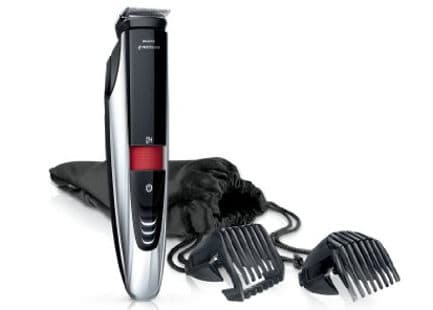 • Dual headed trimmer with a laser guide. • 2 combs, one for the beard and one for the detailer side. The Philips Norelco Beard trimmer 9100 sells for well under $100.00 which appears to be a great deal considering all its advanced features. It also comes with a 2 year manufacturer´s warranty. Potential users do need to keep in mind that Philips Norelco Beard Trimmer 9100 is not a shaver, but it will cut quite close without using any comb. It is designed for those men who have a beard and want to keep it professionally trimmed without having to visit the local barber or hair stylist. However, as a dedicated beard trimmer, the 9100 is able to both trim your beard and help you accomplish that professional detailing that most users find so useful. Overall, it provides a good value for those men who want to grow a beard and keep it well maintained.